Background: March through July of 2017 was a period of above average rainfall in much of New York. Rainfall often came as heavy downpour events, leading to agricultural damage and disease. The purpose of this survey is to gather information on regional impacts and how farmers coped with this situation, so that farmers and those institutions and industries that support farmers will be better prepared in the future. Last week temperatures ranged from normal to 4 degrees above normal. Precipitation ranged from half an inch to 3 inches, with a few isolated areas getting more than 3 inches. Base 50 growing degree-days ranged from 80 to 160. Today temperatures will be cooler, in the upper 60’s to upper 70’s. It will be a mostly sunny day, but a few sprinkles are possible in western to central NY. Overnight lows will be in the mid 40’s to mid 50’s. Friday will be sunny with temperatures the mid 60’s to mid 70’s. Overnight temperatures will be in the mid 40’s to low 50’s. Saturday’s highs will be in the upper 60’s to mid 70’ and sunny. Overnight temperatures will be in the upper 40’s to mid 50’s. Sunday will by sunny and dry with highs throughout the 70’s. Overnight temperatures will be in the upper 40’s to mid 50’s. Monday’s highs will be throughout the 70’s with sunny conditions. Lows will be in the upper 40’s to mid 50’s. Tuesday will have temperatures throughout 70’s. Lows will be in the 50’s. Wednesday, temperatures will be in the 70’s with scattered showers possible. Lows will be in the 50’s. The seven-day precipitation amounts will range from a trace to near ¼ “. The 8-14 day outlook (Aug 31 – Sep 6) favors below-normal temperatures for western, central, and northern NY. Southeastern areas of the state can expect near-normal temperatures. The precipitation outlook favors above-normal precipitation amounts for all but northern parts of St. Lawrence, Franklin, and Clinton counties. Last week temperatures ranged within 2 degrees of normal. Precipitation ranged from less than a quarter inch to 2 inches for most of the state. Base 50 growing degree-days ranged from 80 to 160. Frontal systems will bring showers and thunderstorms Thursday into Friday. Sunday & Monday will be sunny and dry. The next system moves through Tuesday evening into Wednesday. Today temperatures will be in the upper 70’s to mid 80’s. A frontal system will bring increasing clouds and a chance for showers and thunderstorms in the afternoon into the night, with heavy rain possible overnight. Overnight lows will be in the upper 50’s to upper 60’s. Friday temperatures will be in the mid 70’s to low 80’s, with scattered showers and thunderstorms. There is a possibility of sever storms with hail, strong winds, and locally heavy rainfall. Overnight temperatures will be in the 60’s. Saturday’s highs will be in the mid 70’s to mid 80’s with scattered showers possible. Overnight temperatures will be in the upper 50’s to mid 60’s. Sunday will by sunny and dry with highs in the upper 70’s to mid 80’s. Overnight temperatures will be in the upper 50’s to low 60’s. Monday’s highs will be in the 80’s with sunny conditions. Lows will be in the low to mid 60’s. Tuesday will have temperatures throughout 80’s. Lows will be in the low to mid 60’s. Showers and thunderstorms will develop overnight and continue into Wednesday with a passing cold front. Wednesday, temperatures will be in the upper 70’s to mid 80’s with showers and thunderstorms. Lows will be in low to mid 60’s. The seven-day precipitation amounts will range from ½ ” to near 2”. The 8-14 day outlook (Aug 24-30) slightly favors below-normal temperatures for western to north-central and southeast NY. The precipitation outlook slightly favors below-normal precipitation amounts for western NY to northeast NY. Last week temperatures ranged within 2 degrees of normal. Precipitation ranged from less than a quarter inch to over 4 inches in isolated ares. Base 50 growing degree-days ranged from 70 to 150. A weak cold front will bring scattered showers and thunderstorm Thursday evening through Saturday. Sunday through Wednesday carry a chance for isolated showers but will be mostly dry. Thursday temperatures will be in the upper 70’s to mid 80’s. Most areas will stay dry, but there is a slight chance for scattered showers and thunderstorms, more so for the northern Adirondacks and Champlain Valley. Overnight lows will be in the upper 50’s to low 60’s. Friday temperatures will be in the mid 70’s to low 80’s, with scattered showers and thunderstorms possible. Overnight temperatures will be in the 60’s. Saturday’s highs will be in the mid to upper 70’s with showers and thunderstorms possible and increasingly humid. Overnight temperatures will be in the low to mid 60’s. Sunday highs will be in the mid 70’s to low 80’s with isolated scattered showers. Overnight temperatures will be in the mid 50’s to low 60’s. Monday’s highs will be in the 70’s to low 80’s with isolated scattered showers. Lows will be in the mid 50’s to low 60’s. Tuesday will have temperatures in the mid 70’s to low 80’s with isolated scattered showers. Lows will be in the mid 50’s to low 60’s. Wednesday, temperatures will be in the mid 70’s to low 80’s with isolated scattered showers. Lows will be in the mid 50’s to low 60’s. The seven-day precipitation amounts will range from ¼” to near 1”. The 8-14 day outlook (Aug 17-23) slightly favors above-normal temperatures in far northern NY and slightly favors below-normal temperatures in southeast N, other areas can expect near-normal temperatures. The precipitation outlook slightly favors below-normal precipitation amounts for southeast NY and favors near-normal amounts for the rest of the state. Western Bean Cutworm, an emerging pest of field and sweet corn in the Eastern U.S, prompted the farmer-driven Northern New York Agricultural Development Program to fund field research in 2016. The results of those trials are now posted at www.nnyagdev.org as the work continues in cornfields this summer. 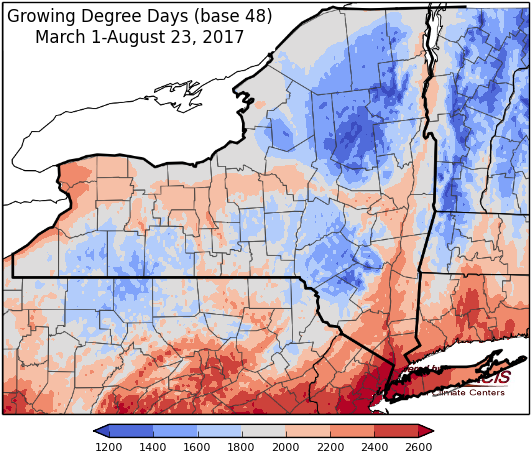 In 2016, Northern New York farms had the highest trap counts for Western Bean Cutworm (WBC), according to scouting reports by Cornell Cooperative Extension field crops specialists and the statewide NYS Integrated Pest Management (IPM) WBC monitoring network. Nine of the top 10 highest trap count sites for WBC moths in 2016 were in St. Lawrence, Jefferson, Franklin, and Lewis counties. While no economically-significant infestations have yet been recorded, corn growers are concerned that kernel feeding damage by the WBC larvae present an opportunity for mold and pathogen growth that would impact feed quality, animal health, and milk production. The 2016 field research on working farms in Northern New York evaluated the effectiveness of corn seed modified to include a Bt trait developed to manage WBC. The research was prompted by reports that some Bt corn was not adequately managing WBC. “The 2016 research trials evaluating Bt corn with the Cry1F and Vip3A traits side-by-side showed failure of the Cry1F trait to adequately control Western Bean Cutworm. The Vip3A trait has worked well in Northern New York,” said Cornell University Cooperative Extension North Country Regional Agriculture Team Field Crops Specialist Michael Hunter. 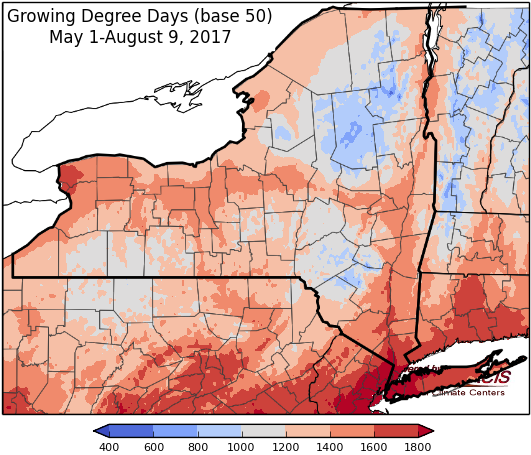 Hunter and Cornell University Cooperative Extension North Country Regional Agriculture Team Field Crops and Soils Specialist Kitty O’Neil conducted the 2016 field trials in cooperation with Cornell University entomology, plant pathology, and IPM specialists. The WBC research continues with new funding from the farmer-driven Northern New York Agricultural Development Program in 2017. 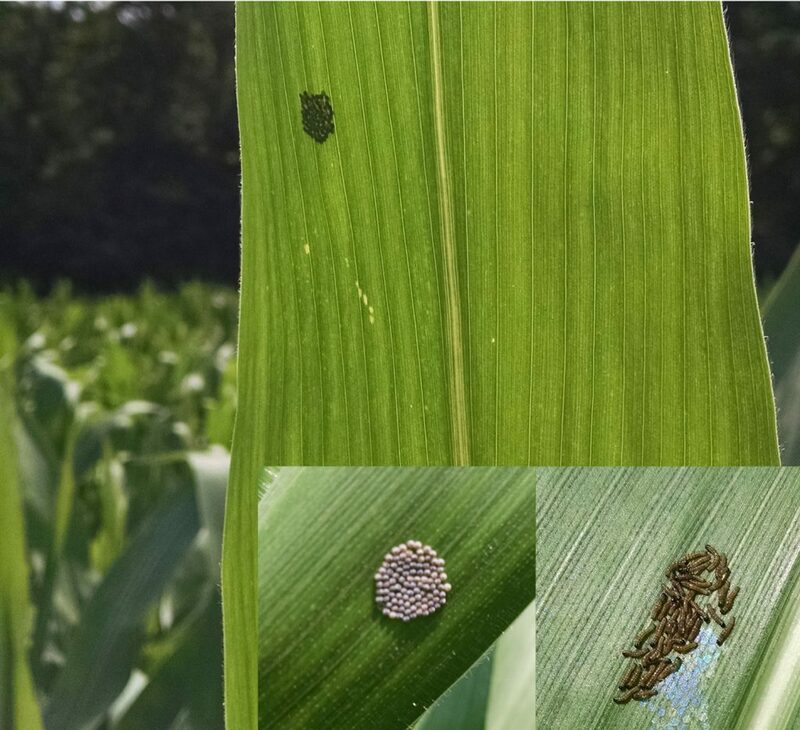 As of late July, two cornfields in Jefferson County were found to have enough WBC egg masses and newly-hatched larva to require an insecticide treatment. Female WBC moths look for pre-tassel corn to lay eggs. The eggs hatch and growing larvae eat tassels and make their way down the plant to the ear where they eat silks and, eventually, developing kernels underneath the husks. Peak population numbers occur in late July and early August. “This year, because the corn tasseling is later than normal, Western Bean Cutworm damage may be partly avoided. The larva do not eat corn leaves so if there is no tassel for the larva to feed on, they will starve to death,” O’Neil explained.